The Egyptian Red Sea offers some of the world's best scuba diving with superb visibility, countless varieties of hard and soft coral, and incredibly diverse underwater topography. The coastline boasts some spectacular wall and shipwreck dive destinations. The Red Sea has abundant and diverse fish life including various types of grouper, stingray, parrotfish, angelfish, butterfly fish and turtles. The comfortable water temperature (64 to 79°F/18 to 26°C) means that diving is popular year-round. However, visitors should note that outside temperatures can reach 104°F (40°C) in July and August which is anything but comfortable for some, even on a beach holiday. 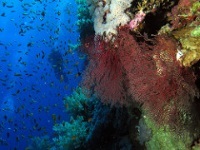 The Red Sea resorts of Sharm el-Sheikh and Dahab are popular bases for divers. Situated near the southern tip of Egypt's Sinai Peninsula, they offer easy access to some of the best dive locations, including Ras Mohammed National Park and the Straits of Tiran. Other resorts popular with divers and snorkellers are Hurghada, El Gouna, Taba Heights and Makadi Bay. Although the Sinai region has become dangerous for tourists the main resorts are still safe. Travellers are advised to be very cautious when travelling outside of these resort areas.